My husband and I find giving much more rewarding than receiving. We are trying to teach our children that being happy and living surrounded by love are more important than any material object you can buy. We are trying to teach them that it is important to help those around us when we can. If we start while they are young, I am confident it will help them grow into good people. We are so fortunate to have a roof over our head and warm food on our plates; our girls don’t know the difference. They aren’t aware of the poverty around the world because they are so young. Just before a family vacation to the sweetest tiny town in San Pancho, Mexico, my father-in-law made us aware of the organization Pack for a Purpose who make it possible to donate needed supplies to a local community center, Entreamigos. 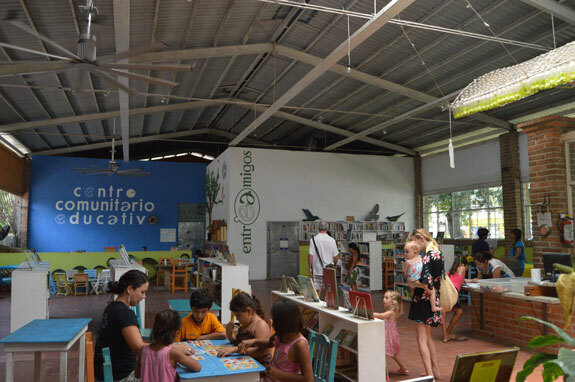 I did some research on the organization and was impressed with the amount of positive energy they bring to the people of San Pancho and around the world. I spoke to my 3-year-old daughter Piper about giving some supplies to the children at Entreamigos and explained to her they don’t have as much money as we do to buy their own crayons and paper. She was excited to help me pick out supplies to pack up in the empty spaces in our luggage and even more excited to give them to the children at Entreamigos. 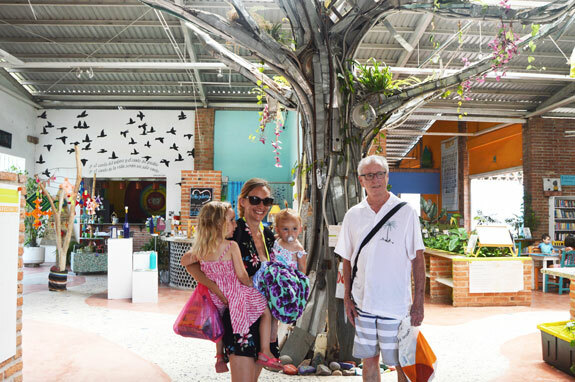 During our trip, Megan Beh, a volunteer from Minnesota living in San Pancho for the summer, gave us a tour of Entreamigos and told us more about the program which is so much more than a place for kids to go after school. She told us how the facility grew from a simple table in front of a store front in 2006 teaching kids English and arts and crafts to the 16,000 sq foot educational facility it is now, helping people learn crafting skills to create items to sell and make a living, and teaching courses on a wide range of subject from parenting to circus school. 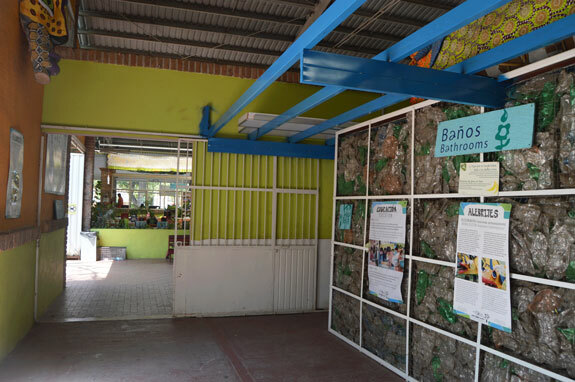 The building was renovated with 80% recycled material found throughout the town. The walls of the bathrooms are made from plastic bottles. The innovation and resourcefulness is astounding. We should all take note of what we can do with our waste which they consider tools to build a better life for each other. The artwork painted in the gym and courtyard is beautiful. Planters made from tires in the garden are whimsical. 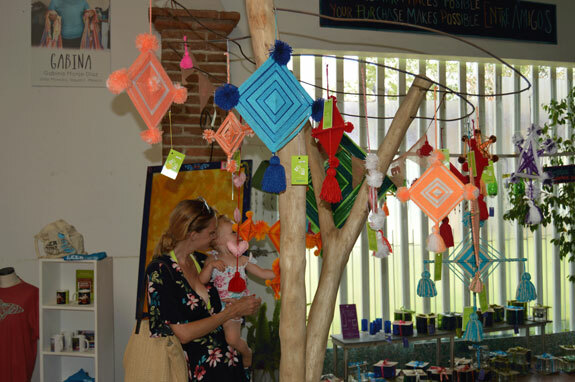 In the storefront anyone can visit and purchase the crafts created by the local members of Entreamigos. Piper fell in love with a hand crafted mermaid and my 1-year-old Kenzie, loved the wind chimes. The people of San Pancho are so lucky to have such an amazing program they can be a part of. We were proud to contribute to the good they bring to the community and will do it again if we have another opportunity to visit. The next time we travel we will be sure to check and see if Pack for a Purpose has a program in our destination. Giving something so small as a box of crayons could put a smile on the faces of several children and costs us almost nothing. Mother. Wife. Blogger. Hoping to help the world a little bit at a time.